Unfoldment of all of Life's Forces. Daytona, then Seabreeze, FL. 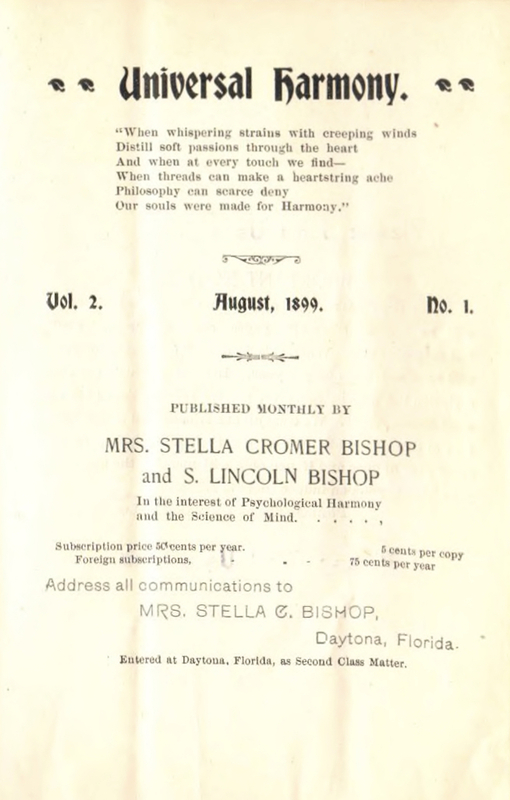 Editor: Stella C. Cromer Bishop (1860-1952) and S. Lincoln Bishop. 1/1, July 1898. 16-28 pp., 5x7, 50 cents then $1.00 a year. Noted in Occult Truths, July 1899, and in "List of Advance Thought Publications," The New Cycle, March 1900, 159-60. The advertisement in the Flaming Sword, October 1899, says enigmatically: "Music and The Arts and the highest unfoldment of all Life's Forces are now successfully taught by the power of TRUE INSPIRATION. My method is not a remedy that only palliates, but it leads to a true solution of all inharmonies. Send Two-cent Stamp for a sample copy of my monthly publication . . . ." The Occult and Biological Journal, 1901, notes S. Lincoln Bishop's series of pamphlets called "Universal Harmony Library, the Truth about Healing," and opines that the author "is familiar with the idea of regeneration," that is, that he advocated some form of sexual continence or abstinence. They based their teachings on the "Law of Inspiration by which we may become inspired musicians, artists, sculptors, writers, orators, poets, inventors, healers, seers, adepts or any thing else that is good and true and noble." This was available to those who "live lives of purity and love free from all selfishness and greed for material gains"-and who presumably also subscribed for the Bishops' lessons and psychometric readings. The Bishops were peripatetic, moving to Colorado, then Kansas (where they were postmasters) and finally to Texas. In Colorado in 1902 they promoted their Harmony Circle, which had for its object "the Mutual Harmonic Development of the Soul Forces, producing Health, Power and Success," all for $1.00. University of North Carolina, Chapel Hill, has 2/1, August 1899.